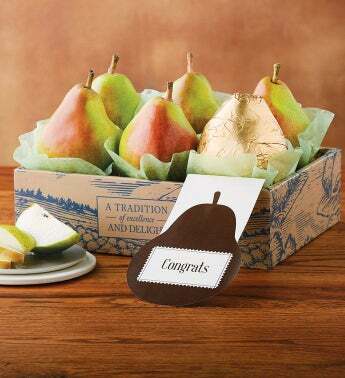 Celebrate the accomplishments of a friend or loved one with a spectacular gift of nature's finest fruit. Sweet and juicy Royal Verano™ Pears are nestled together with one wrapped in gold foil for an extra-special touch. These delicious delights arrive with a commemorative placard bearing the word "Congrats."